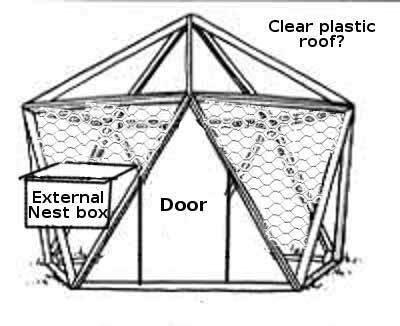 The plans for the new chicken coop upgrade now include an external nest box. We might add some removable panels that can be installed each Winter to block the cold wind. I'm still undecided on what type of roofing material to use. Clear plastic panels (e.g. polycarbonate) would cost you a pretty penny. And they would probably turn the coop into an oven in the summer. If you have some spare roofing tin that would work. Make sure that the joints between the triangular panels overlap to keep rainwater out. I like it! I may have to steal that design when we get our property situation settled. I think the clear plastic roof would be nice in the cool seasons but you would need shade cloth in the summer. It would be easier to seal the roof with a standard gable type roof. There is something attractive about a round or octagon coop though. No corners to clean out for one. I don't know what happened, but I can't remove the duplicates, so feel free to clean up my mess.